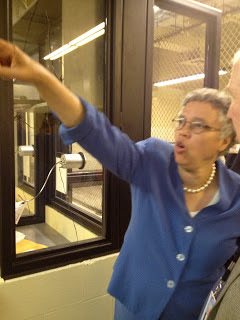 Every goddamn day: 04/21/19: Flashback 2011: Toni Preckwinkle; "Most people in the jail are guilty of being poor." Flashback 2011: Toni Preckwinkle; "Most people in the jail are guilty of being poor." I spent Tuesday afternoon with Cook County Board President Toni Preckwinkle—I'm writing about that in the paper tomorrow. The visit made me remember our first visit to the bond court together in 2011, and I thought I'd dig out this column, even before clown car candidate Willie Wilson held a press conference, also Tuesday, claiming that Preckwinkle is trying to steal credit for reforming the bond court system, credit that he, Willie Wilson, somehow deserves, a notion which is ... searching for a word that isn't actionable libel ... poppycock. The following was published in 2011, a year when Willie Wilson was busy expanding his medical supply company to China. It's lunchtime, but Toni Preckwinkle isn't eating lunch. Instead the president of the Cook County Board is in a black Chevy Suburban, heading to the criminal courts at 26th and California to take a field trip. The county is spending $109,000 a day on prisoners who can't make a $2,000 bond. "If you have a $2,000 bond, you pay your $200 and you're out," she says. "If you have a $2,000 bond and you're impoverished and you don't pay it, are you any more of a risk? No, you just don't have $200. . . . Most of the people in jail are guilty of being poor." The solution, she says, is more electronic home monitoring. It costs $143 a day to jail a prisoner but only $65 to monitor somebody. "What happens in bond court is our top priority," she says, noting that, when she last visited in June, few she saw got monitoring. Saving money is not the only thing on Preckwinkle's mind as we approach court. "Eighty-three percent of the people who come in the jail, whether or not there for drug offenses, have illicit drugs in their system," she says. "We are dealing with substantial substance-abuse issues by detaining people in the jail, and we're only detaining of course black and brown people. Basically, you saw a story in your own paper how whites are most likely to use illegal drugs. If you look at bond court you'll never know that. The people there are black and brown. The last time I was there I sat for 45 minutes and I think there was one white person. So the jail is the intersection of poverty and racism. It's pretty stark." It sure is. We arrive shortly after noon, and Preckwinkle, about 6 feet tall, strides ahead, leaving her aides scrambling to catch up. She enters Room 100, the Central Bond Court. Associate Judge Donald D. Panarese Jr. is on the bench, hearing the case of Jamal Smith, 29, his hands chained to his waist, wearing the scarlet DOC jumpsuit reserved for notoriously violent prisoners - Smith is accused of attacking a correctional officer. It's hard to convey just how fast these cases are handled—from 80 to 100 in a court call lasting a little over an hour. At times it's like listening to auctioneers argue the law - the cases of some defendants are dispatched within less than 15 seconds. "What astounds me is how quickly decisions are made to deprive people of their liberty," she says. "It's profoundly disturbing that your liberty is decided in a heartbeat." She points at a clerk filling out forms. "She's using carbon paper!" Preckwinkle whispers, amazed. In this digital age, carts of files are still wheeled around the court. The cases fly by. Aggravated battery. Possession of a controlled substance. Retail theft. Fleeing. Most of the defendants are African Americans, with a few Hispanics and two white women accused of prostitution. Of the scores of defendants we see, exactly one - an Egyptian accused of selling counterfeit goods - has a private attorney. Preckwinkle is particularly pained by a pair of 11th-grade boys picked up on a drug charge. "Those kids are going to be in jail because nobody can come up with $200 - and they're 17 years old!" she says. She'd like to see pot offenses become tickets, and nonviolent offenders kept from jail. Cook County Circuit Court Chief Judge Timothy Evans says that while he is sympathetic, "obviously, our approach is justice first. The statutory requirements we have to follow do not focus on revenue saving." For example, he points out that a third of defendants ordered to receive electronic monitoring never get it, a decision made by the sheriff's office for various reasons. You can't home monitor a man without a home. "Succeeding somebody who is inept is a mixed blessing. On one hand, the bar is low. And on the other hand, things are a mess." Will Toni Preckwinkle be able to clean up an enormous system that was allowed to marinate in waste and corruption for decades, to trim and buff it into streamlined efficiency? Can she take the entrenched human disaster we are left with after centuries of slavery and systemic prejudice and recast it into something more economical and just? That's a tall order for anybody. But it sure is encouraging to see someone sincerely and vigorously try, if only as a change of pace. Preckwinkle is one of the few qualified mayoral candidates. It would be good to see her win. I don't know if I would wish such a hopeless job on such a nice person. I guess I can't say that Rahm is "inept," but I think he's still struggling with the mess Daley left for him and his successors.